Vampires, vampires and more vampires! That's the key behind this interesting Gothic inspired anime series and in this alternate universe, vampires and humans now have a truce after years of warring. Unfortunately for both these species, a new type of creature has emerged called the Kowloon which threatens the very planet itself. Joining forces, both vampire and human are attempting to annihilate this new threat, however one bite from the Kowloon instantly turns their victim into one of these dangerous creatures that are hell bent on bloodlust. 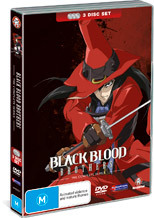 The series itself revolves around Jiro Mochizuki, a key founder of the alliance between humans and vampires, however he has long since been exiled as he searches for a home with his younger brother Kotaro. A new city also emerged from the war called the "Special Zone" which is run by a corporation called the Order Coffin Company which holds the peace within these walls. The series is extremely strong on plot, action and adventure as we follow these two outcasts and both their stories and those of others really begin to draw you in. Jiro is almost a superhero, however his two weaknesses are water and sun that generally always effect his battles, however seeing him fight is pure bliss. The creators have created some great flashbacks during the series which assist in the back-story of Jiro and the shroud of mystery around Kotaro that at times is reminiscent of the TV series Lost. Another key character is Mimiko who not only serves as Jiro's love interest but as his guide and their relationship is quite in-depth, without it becoming too cliché. Needless to the say, the mystery behind both characters is the drive behind this series and when the secrets are let out of the bag, the series goes into high gear and just as it started, it unfortunately finishes abruptly after 12 episodes. The audio quality of the presentation is quite good with clear audio and sounds that is complimented with widescreen that truly enhances the animation and colours. Definitely a first class anime presentation. When it comes to extras, there are some interesting TV spots, multiple Japanese commentary and some original commercials. In conclusion, Blood Brothers is a great anime series that really makes use of the supernatural "vampire" genre that contains strong characters, a great story and impressive animation. The only downside to the series is that there are some questions still to be answered.